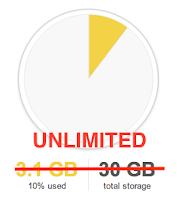 Google Apps at BSU now has more storage space, 30GB, unlimited storage, and you can store files up to 5 TB each. 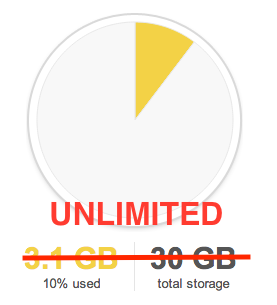 Just as before any documents created in Google, docs, spreadsheets and presentations, do not count toward your limits, also any images smaller than 2048x2048 pixels are free. If someone shares a file with you it doesn't eat into your allowance, more info here. If you need to transfer a large file, up to 10GB 5TB, add this to your drive and share it with the intended recipient, once they have downloaded it simply remove it to regain the space. Remember that any shared files will disappear from the recipient so make sure they have a copy! Any files you add belong to you, if you share them you still own them, if you remove them they've gone. For more on sharing click here. To check your allowance follow this link.